Today, we chat with Christine Brandes and Hanan Alattar, who share the role of Pamina in The Magic Flute. Brandes has previously appeared in Seattle as Susanna in The Marriage of Figaro and Cleopatra in Giulio Cesare (the latter of which was conducted by Gary Thor Wedow, who has also returned for Flute). 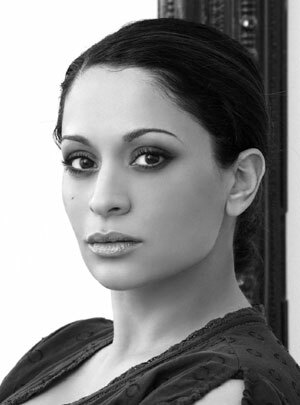 Alattar, on the other hand, is making her company debut in the role, though she has previously performed with the Seattle Symphony. We talk to both sopranos about relating to Pamina...and what the princess thinks about her mother, the fearsome Queen of the Night. Tamino falls head over heels in love with Pamina upon seeing only her picture. Do you find that romantic, or just creepy? CHRISTINE: I think it is a romantic idea—rather sweet, in principle. HANAN: Haha, well, it would be creepy if it was via Facebook in 2011... However, my picture in a locket belonging to my mother who is a queen and in a world where he is a prince looking for his princess.... Wowies! Romance in all its glory is certainly in the air. 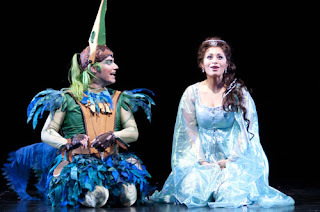 Leigh Melrose (Papageno) and Hanan Alattar (Pamina). Does Pamina's relationship with her mother change over the course of the opera? How does she feel about the Queen at the end of the opera? CHRISTINE: Initially, Pamina trusts her mother, believes she will rescue her from this circumstance and has her best interest at heart. Pamina gradually realizes that, as one might suspect with queens, she is completely driven by her own self-interest not the hoped-for unconditional love. While she has compassion and understands what has driven her mother to the point of madness, she has definitely broken with her and found her own path. HANAN: Yes—even though Pamina loves her mother, she has had to make decisions that will secure the kind of future that she wishes to have in her life. I think that Pamina grows up a lot during the course of this opera. She meets the love of her life, sees her mother in a completely different light, goes through dangerous trials and in the end decides to move forward with her partner on a separate path. It's not that she now dislikes her mother; she still loves her! But, she sees that her mother's methods might not be the best way for her in her own life. As modern women, how do you relate to Pamina, who is denied so many of the freedoms we take for granted today? CHRISTINE: She is easy for me to relate to. The path to Tamino is not easy and once they are together, they have trials to overcome as a couple. She is strong-willed, follows her heart and speaks her truth. Gotta love all of that! Ultimately, she gains all those freedoms as she and Tamino walk off into the sun(set) to make a different world for themselves—as equals. HANAN: The biggest shift you see and hear in Pamina is when she figures out her own tests in the trials. She calms down and actually takes the wheel for a while! She says, "I myself will guide you. Love will light the way for me... Play the flute. It will protect us. It was made by my father,” and so on. She becomes the equal, and they say the last lines together. And that's where the show leaves us, both sides moving together towards the new future. Christine Brandes (Pamina) and John Tessier (Tamino). Christine, this is your second time working here with Gary Thor Wedow. How would you describe your collaboration with him? Working with Gary is a complete delight. He is a fantastic musician and conductor (two characteristics not always found in one individual!) and is a dear person. I also trust him when it comes to musical, vocal, or dramatic observations. How did you get started in opera? What do you say to people who don’t find this art form relevant? I came into "straight" opera a bit through the back door. I was doing lots of baroque opera, was scooped up by a manager after one of those performances, and gradually found doors opening to mainstream houses and repertoire. I would suggest that people who don't find this art form relevant just aren't paying attention. Maybe relevant isn't the right word. Opera does many things. It uplifts, entertains and amuses and hopefully inspires some kind of emotional response. If a magnificent phrase can transform one's spirit, even for just a single shiver, our work is done. Those are the moments that reaffirm and feed our souls. I hope opera is thought-provoking and perhaps can give a new perspective to a nagging issue in one's own life. Okay, so stabbing your rival may not always be the answer to your problems, but perhaps other options will arise! 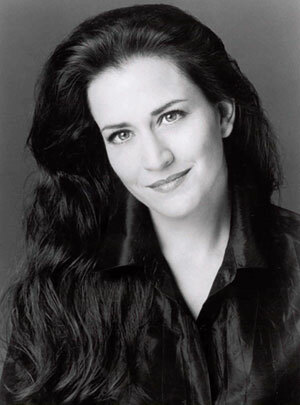 Hanan, you recently sang the Mozart Requiem with Seattle Symphony. Was that your first visit to our fair city? Do you have exciting plans for extracurriculars while you’re here? I sure did, and it sure was my first visit! I am a major coffee person, so I have been exploring all of the local coffee houses. Also, I love the outdoors, so I am truly enjoying walking around the city and seeing its beautiful landscape. You’ve sung your fair share of new music and opera in English, as well as lots of Mozart. Tell us about Goldenthal’s Grendel. Goldenthal's Grendel was a heroic task taken on by Los Angeles Opera and the wonderful, whimsical world of Julie Taymor. It was cool on many levels. Goldenthal is actually Julie's partner as well, so there was such a strong connection from text to music, to puppets, and to the drama. The cast was phenomenal, including Eric Owens, Denyce Graves, and Laura Claycomb. I totally had a crush on Eric Owens’ voice after that show, wow. I was part of Denyce Grave's three-pronged tail. 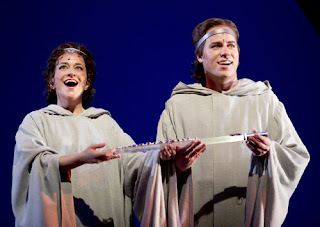 (My first glorious role at Los Angeles Opera!) My costume took three hours to prepare every evening. I also covered Laura Claycomb's role at the same time. There was a bit of drama with a delayed opening of the show due to a computer malfunction, but it was so worth the wait. The set, the amazing costumes, and the music really took you to another place and time and kept you suspended there until the very end. I wish it would be done again. We performed it in New York as well, and all nights were sold out. I think it is one of those shows that you would say to your friends and colleagues, "Don't miss this one. You really, really have to see it—at LEAST once!" What a nice interview! I am actually a great fan of Christine! When I saw her for the first time acting, it was amazing, splendid, magical!I am happy such talented people still exist! !